The XR19 was designed to be an alternate to the XRT20 but without the requirement of a separate column that takes up so much floor space. The XR19 takes up less than 26" of wall space, has good dispersion and provides high power handling at high frequencies. The XRT20 column and bass cabinet takes up 45" of floor space. The production XR19 has the same bass cabinet as the XRT20 including the two woofers and 8" mid-range. Since a column of tweeters do not fit the design criteria, the first prototype had a horizontal column of twelve tweeters arranged in a semicircle around the top. 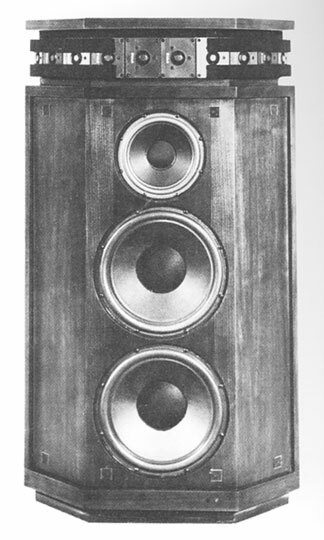 The woofers were mounted on two faces. At the right top a capacitor decade box can be seen. We made several inductor and capacitor decade boxes, both with series resistors that could be switched in and out. This saves lots of design time winding new coils and soldering them in place. Casters are attached under most of the larger system prototypes so they could be moved around the lab easily. We found that there was too much high frequency output to the sides of the system, perhaps influenced by angling the tweeters and changing their polar pattern with respect to each other. In addition, this could be a problem if the system is located against one wall in a corner. Vertical response is inherently very good. Felt strips are placed above and below the tweeters to prevent edge reflections from above and below. Floor reflections are low because the tweeters are located at the top of the cabinet. The curved array is an alternate solution to providing good dispersion with a short column. It also works very nicely on the top of an XRT20 cabinet. 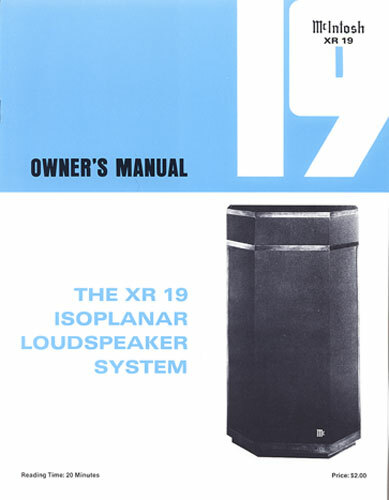 Although only 12 tweeters are used in the XR19, the power handling is still comparatively high at 150 watts of program material from 1.5kHz to 20kHz. 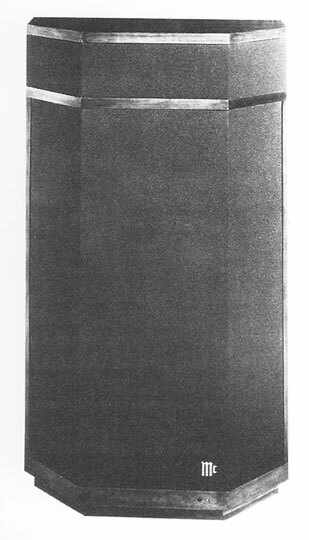 Later, with the design of the XRT18, another solution was found to improve the vertical directionality of a short vertical column. Instead of both woofers covering the same frequency range, the lower woofer goes from 20Hz to 150Hz. The upper woofer goes from 20Hz to 250Hz. The use of two different woofer crossovers reduces interference between the woofers in the upper bass where the distance between them is significant compared to 1/2 wavelength of the sound being radiated. This improvement is used in the later version of the XRT20. 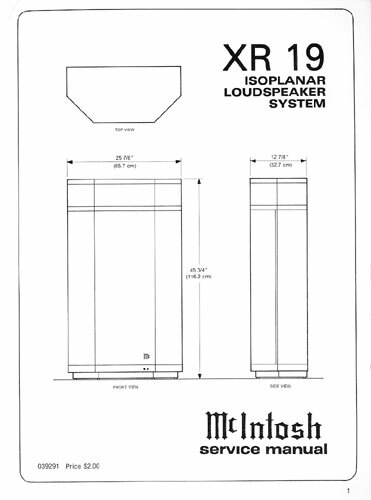 The 8" mid-range is contained in a sealed enclosure and covers the range from 250Hz to 1500Hz. The crossover is located in the top section with the tweeters. The top is easily removed by unlatching two fasteners. The XRT20 laminated crossover coils and motor running capacitors are used in the XR19 for extra low distortion and reliability. Of course, I wrote the owner and service manuals as well as the production bill of materials and test specifications. In my opinion, the XR19 is overlooked gem. Not many of them were sold compared to the XRT20 and XRt22. The excellent imaging presents an outstanding sound stage and there is lots of bass punch from the two woofers. This is clearly a dramatic step up from the earlier XR7. As far as I know, no literature was ever made for the XR19 except for the black and white pictures from the manual that were used in the direct mail advertising.